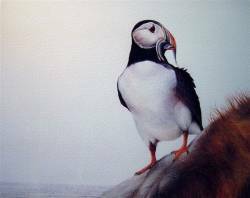 Puffin by Nicholas Day Prints Now you can own a signed limited edition print, (only 50 printed), by a successful Wildlife Artist using an original medium. At an affordable price! THIS IS A BEAUTIFUL PIECE OF ART:SUE B. - U.S.A. Image shown,"Puffin At Nest Site"in an acid free mount.Size of the print is 12" by 15"(38cm by 30.5cm)This is signed and numbered limited edition of 50 only.Printed to a very high resolution and standard, on superb quality paper with fast inks to guarantee total colour strength for at least 80 years under normal conditions.You will be very impressed with the price and the quality of this mounted print. The Puffin is probably the best known member of the Auk family, although there are another 21 species including Guillemots and Razorbills. It is instantly recognisable with its brightly coloured bill and well liked by all birdwatchers. The Atlantic or Common Puffin (Fratercula arctica) is the species which is seen in Shetland and the rest of Britain. It nests in burrows (which they usully dig themselves with their very sharp claws) amongst boulder scree and also in cracks in the cliffs. About one fifth of the total Puffin population of Scotland breed in Shetland, approximately 125,000 pairs. Most of the large coloured part of the Puffin's bill (the bright bluish and yellow areas closest to the head) is simply a decorative sheath and is shed during the winter, to be regrown each spring at the start of the breeding season. In winter plumage therefore their bill appears much duller in colouration and noticeably smaller. Almost all Puffins leave Shetland during the winter months returning to their breeding areas from March onwards. Large 'rafts' (groups of birds swimming together) of Puffins may be seen on the sea at this time as they gather around their breeding areas. They lay only a single egg and the chick is fed in the burrow on small fish. Most Puffin colonies are empty soon after mid August. The best time to visit a Puffin colony is in the morning or early evening as most of the birds are at the fishing grounds during the day. During the incubation period Puffins spend more time ashore, but the extent of colony visits is variable, and although they may be ashore for long periods of time there may not be much activity. Exciting behaviour will be sporadic - when a pair may quarrel or a gull flies over causing the Puffins to take flight before landing again or to preen or sleep. During the chick rearing period (June to early August) the adults can often be seen bringing beakfulls of food to their young. An observer, sitting quitely at a good vantage point near a colony just before sunset, will be able to watch many different behaviour patterns, e.g. head jerking and bill tapping. At the southern tip of mainland Shetland, Sumburgh Head holds a colony of about 5,000 birds all breeding in the steep grassy banks and cliffs leading up to the lighthouse. This is probably the easiest colony to visit as it is an R.S.P.B. reserve and there is a public road all the way to the lighthouse and ample parking facilities. This is a very ancient colony as Puffin bones are common in the ninth and tenth century dwellings at the nearby Jarlshof Viking settlement. How to get there Take the main south road to Sumburgh Airport but follow the road past the Airport turnoff. This road then leads all the way to the Sumburgh Lighthouse. Lying only a few hundred metres off the east coast of Bressay (just across from the main town of Lerwick), the Isle of Noss holds about 2,000 pairs. They breed around the grassy cliff tops, and in cracks in the high cliffs of the isle, especially around the Noup of Noss (the highest point). How to get there Take the inter-island car ferry from Lerwick to Bressay. Cross Bressay (about 2 miles) to the Scottish Natural Heritage landing stage where the two annual wardens operate a Zodiac inflatable ferry service across the narrow sound. The island is only open for visitors between mid-May and the end of August but this is very weather dependant. Daily information relating to the crossing is displayed at the Lerwick to Bressay ferry terminal. One of the northerly islands, Fetlar holds a population of about 1,500 Puffins almost all of which breed in steep grassy banks and in cracks in the cliffs. They are found all around the higher parts of the island although there are few large concentrations. How to get there Take the inter-island car ferry from Toft in the north mainland to the island of Yell. Travel north across Yell to the Gutcher ferry terminal and take the ferry to Fetlar. Prior booking is recommended as there are only 5 or 6 ferries per day to and from Fetlar. An R.S.P.B. warden is present on the island throughout the year and an interpretive centre is situated along the main road about 200 metres past the shop. Hermaness, a National Nature Reserve on Unst, is the most northerly of the Shetland islands. The colony of at least 50,000 pairs of Puffins is scattered over several miles of boulder screes and heavily grazed steep slopes along the west cliffs of the reserve. This is one of the easiest colonies to walk to and is quite spectacular. As with Fetlar, take the inter-island car ferry from Toft to Yell and travel north to the Gutcher ferry terminal. Take the ferry to Unst and travel north across Unst to Hermaness which is at the very north-west tip of the island. A car park is situated at the entrance to the reserve and routes across the reserve to the cliffs are signposted. An S.N.H. summer warden resides at the shore station beside the car park, where there is also an interpretive centre. Situated near the tip of North Mainland in the shadow of Ronas Hill (Shetlands highest hill at 450m), the Isle of Uyea supports a colony of around 1000 pairs of Puffins nesting in burrows on the top of the isle and in cracks in the cliffs. How to get there Take the A970 to North Roe and walk 5 or 6 km west, either across the moorland or along the hilly north coastline. A very rough track starting just before the school at North Roe leads the way for about 2/3 of the distance but is only suitable for 4 wheel drive vehicles. One of the most spectacular islands, Foula boasts mile after mile of bird-covered cliffs, and also Britains highest cliff - the Kame rising 1220 feet above sea level. Puffins nest all along these spectacular west cliffs, in grassy banks and in cracks in the cliff face. Recent estimates suggest at least 50,000 pairs of Puffins nest on the island. As isolated as it is (lying 14 miles from the nearest point in Shetland), the island can be reached by boat two or three times per week in the summer (weather permitting) from Scalloway (to the west of Lerwick), or by British Airways Express plane (run by Loganair) from Tingwall airstrip (near Lerwick) who operate at least three flights per week. The island can also be day-tripped during the summer months by flying. Lying mid-way between the Orkney and Shetland islands, Fair Isle supports around 25,000 pairs of Puffins nesting on the steep grassy slopes and in cracks in the cliffs virtually all round the island. This is one of the best places in Shetland to get very close to Puffins as there are several colonies on the easily accessible grassy banks around the island. A ferry service leaves Fair Isle for Grutness at Sumburgh twice per week and also from Lerwick once perweek in the summer, and British Airways Express operate at least 5 flights per week to the isle from Tingwall airstrip near Lerwick. As with Foula the Island can also be day-tripped by flying. Puffin colonies are in steep grassy, often slippery, slopes and in steep cliffs - please do not go near cliff edges without suitable footwear, especially in bad weather. It is an offence under the Wildlife & Countryside Act 1981 to intentionally disturb Puffins while they are building a nest, or are in or near a nest containing eggs or young. It is also an offence to disturb the dependant young (while they are in the burrow).